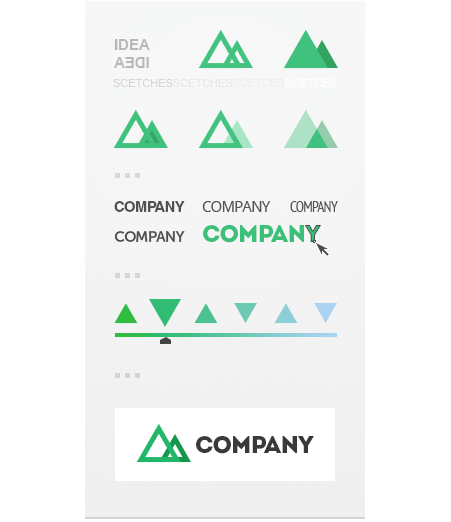 Here’s how it all happens… You create company’s logo design, choose colours, fonts, and think of a catchy slogan. A piece of visual art triggers emotions, thoughts, and makes people think of your company. Just like magic, brand appears due to the people who see and believe in it. It becomes more than just a symbol but an archetype. A Brand is in the mind of the audience. This is how you make people believe. As you see, the professional logo design is the foundation of your brand. After creating, you have to invigorate and connect it with your company and your services in the heads of your users. Business logo design is the kind of sorcery that converts users into customers and loyal clients. Eastern Peak wizards will do the job – it remains for you to just rest on your oars. Our designers will show you various logo designs to understand your aesthetic preferences and come up with a visual style you like. We thoroughly select the words to create a concept that will manifest the essence of your brand. We test them to avoid any unwanted connotations, to make the message crystal clear. At this stage our designers seek for the right visual form to embody the message of your logo. These sketches serve to gather all the meanings your brand will represent. Now it’s time to narrow the designs to those that meet the concept of your brand, its message and culture. We test them on our staff for unbiased opinion and leave only few logos created. We show you the best logos to specify the details and ask for your feedback. Our designers revise them and make 3 perfect logos. We present the best black and white logo designs for you to choose one, only the one you were dreaming about, the one that will become the symbol of your business – Compelling and Flawless. Logo is done. Now it’s time to wisely select the color scheme for it, to take into account emotional connotations of chosen colours. You will be given a choice from the best few. Five minutes before opening champagne. After the restless night we show you IT. The logo that will be on all your promotional products and website. Hard fought, unforgettable. You smile happily, our designers drain to the dregs.